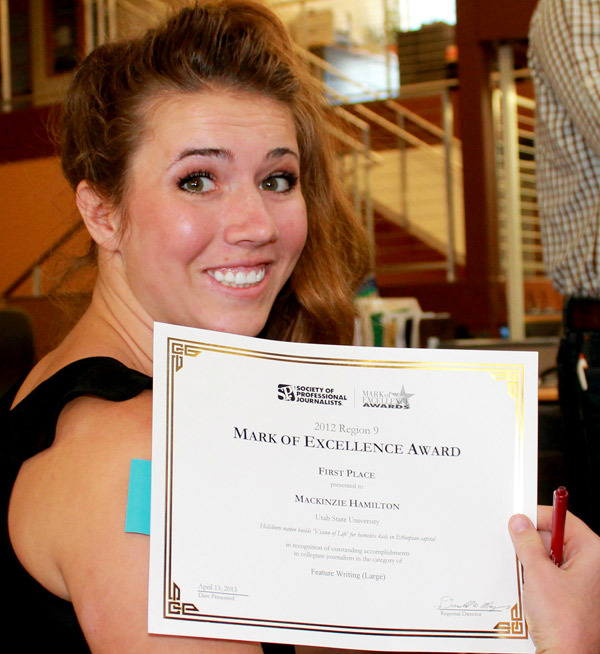 UPDATE: Utah State journalist Mackinzie Hamilton, was notified Wednesday (5/1/2013) that Society of Professional Journalists (SPJ) judges have selected her story as a national Mark of Excellence Award feature story winner. The award will be presented at the national SPJ convention in Anaheim, Calif., in August. Hamilton’s article, “Hillsboro native builds ‘Vision of Life’ for homeless kids in Ethiopian capital,” won first place for feature writing in SPJ Region 9; it was published by The Oregonian and Mormon Times. See details below. Aggie journalists collectively earned 20 MOE awards in 12 different categories, both breaking the school record and earning more awards than any other school in the region. Region 9 comprises colleges and universities in Utah, Wyoming, Colorado and New Mexico. The awards recognize the best in student journalism, and Rio Grande SPJ Chapter President Laura Paskus said she was impressed with the quality of work submitted by students this year. Among USU entries, Utah Public Radio students collected six Mark of Excellence wards; The Hard News Café won five; Aggie BluePrint won three, and A-TV News and The Utah Statesman each won one. USU sophomore Mackinzie Hamilton and senior Rhett Wilkinson tied for best performance by a single student, each with three awards. Hamilton’s first-place entry in the feature writing category, “Hillsboro native builds ‘Vision of Life’ for homeless kids in Ethiopian capital”—about a 25-year-old American expatriate who has spent his early 20s helping kids in Ethiopia rather than attend college—was published by both The Oregonian and The Deseret News. She attributes the award to the mentoring she has received as a student in the Journalism and Communication Department at Utah State. “It’s all because Matt LaPlante was willing—or crazy enough—to take three students to Ethiopia,” she said. Students attending the conference were also able to network with industry professionals and take part in professional development workshops. Other first-place winners from USU included Brianna Bodily for Radio News Reporting, and Ryan Cunningham for Radio Feature, as well as Ryan Cunningham and April Ashland for Online Feature Reporting—for stories they aired on Utah Public Radio; Hard News Café’s Steve Kent for Online News Reporting, and Kristi Ottley for Online In-Depth Reporting, and Rhett Wilkinson for Online Sports Reporting in Aggie BluePrint, USU’s online student magazine. The Hard News Café once again was named the region’s best independent student news website, a category it has dominated since the local news website’s founding in the 1990s. In addition to the eight first place awards, USU students also won nine second-place and five third-place Mark of Excellence awards. Aggies swept seven competition categories by winning all awards in Radio News Reporting, Radio Feature Reporting, Online News Reporting, Online Feature Reporting, Online In-Depth Reporting, Online Sports Reporting and won Best Independent Online Student Publication for the Hard News Café. 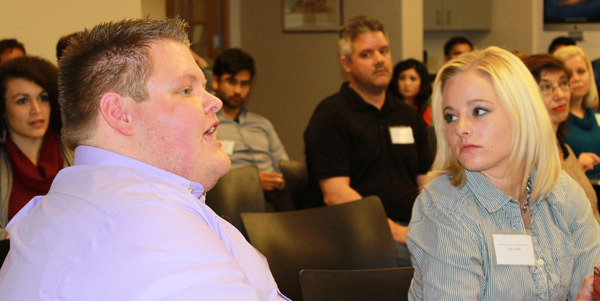 The winning entries appeared in several media outlets including UPR, A-TV News, the Hard News Café, The Utah Statesman, Meridian Magazine, Aggie BluePrint, Yahoo Sports, The Oregonian, and the Deseret News. Coming in second to USU’s 20 total awards, students from Brigham Young University won 18 total awards, while students from Metropolitan State University of Denver walked away with 17. All regional first-place MOE award winners go on to the national SPJ awards competition.